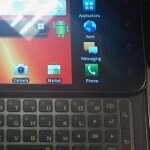 An image of an unknown Android-powered smartphone from Samsung has surfaced and is rumored to be called the Captivate Glyde thanks to its sliding full QWERTY keyboard. The screen on the Captivate Glyde looks to sharp and bright, but there is no word on the resolution or the type of display it is. It is definitely not Android 4.0, so odds are we are looking at a Gingerbread packing device with Samsung’s TouchWiz user interface on top. Around the back of the device is said to be an 8 megapixel camera. We do not know the video recording capabilities of this smartphone. The QWERTY looks to be a decent size with four rows. 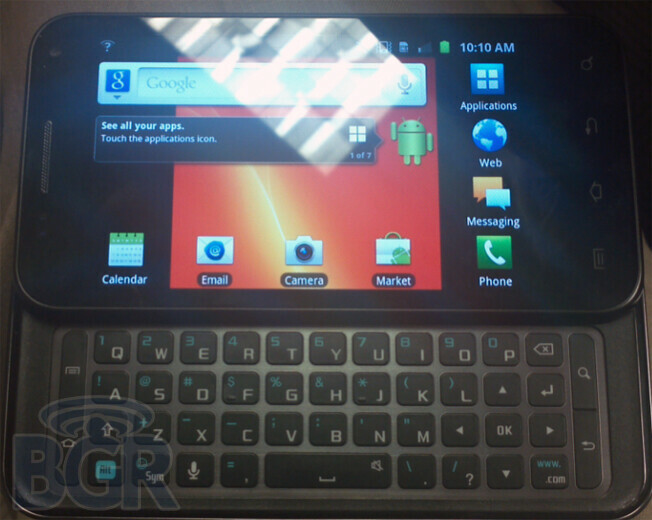 The Samsung Captivate Glyde, if that is in fact what this handset will be called, is heading to AT&T. Hopefully we will have more information to deliver in the near future. Check out the photo and tell us what you think. Oh god, why did you have to recycle that name, Samsung? The original Glyde was a s**t sandwich wrapped in fried platypus scrotums stitched together by tears and heartbreak. Good one, sniggly. That is the first time I've ever seen a pluralization of the word scrotum. And it was legit. Looks like a nice keyboard to me. I'm with sniggly; that phone looks like crap..
LMAO I just busted out laughing at work. Whoops! "The original Glyde was a s**t sandwich wrapped in fried platypus scrotums stitched together by tears and heartbreak." Oh my. I just shat myself laughing. The lesson here is that I should go directly from reading The Oatmeal comics to posting here more often. http://www.phonearena.com/news/Samsung-Galaxy-S-Glide-for-Rogers-brings-the-keyboard-love-to-the-original-handset_id22377 Same phone? If so, it has a similar spec setup to the GSII. (1.2 GHz dual core processor, assumedly Exynos, 1 GB of RAM, etc.) Guess those rumors about a year back about a GSII with a keyboard did hold some water after all. I agree. I hate how the phone manufacturers always skimp out on phones with qwerties, or have good phones with 4-row qwerties. Moto's Droid 3 was an exception, but then again they released it in so few areas. I'm glad to see there are still a number of phones with keyboard sliders being released for people like me who want a physical keyboard.